Prepare slightly thick sugar syrup. Make the strawberry jelly as per the directions given in the packet and keep it ready. 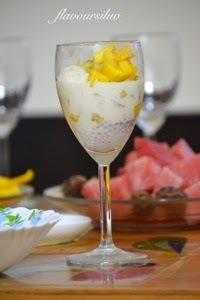 Soak the falooda seeds ( basil seeds ) in water till it bulges. Drain the excess water and keep aside. 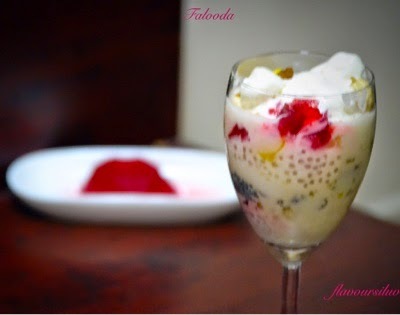 Boil the falooda sav in milk till it cooks. Make sure it should not be mushy. Add few drops of rose essence, mix well and set aside. Cut all the fruits into small pieces. 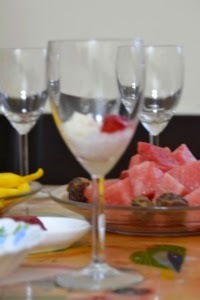 For serving, take a long glass, add 2 tbsp of sugar syrup in the bottom. Then add a spoonful of basil seeds on top of sugar syrup. Add falooda sev, strawberry jelly, chopped fruits and nuts on top one another...add chilled milk in between, top with ice cream. He he....we already said goodbye to winter!